Alessio, of Km Zero Tours making Polentata. This special edition of "Take Us To Lunch" is actually an invitation to a virtual dinner! Our new friends Arianna, Olivia and Alessio of Km Zero Tours take us to an authentic polentata al fresco at a Tuscan casa. Arianna: Polentata is an old recipe from the Abruzzo region, the birthplace of Alessio. This recipe was born as a traditional dish for poor people who could not afford to buy many ingredients or even enough plates for the entire family. It is made with corn flour, a type of flour that typically cost less than wheat flour. People cooked polenta in a large, deep pot, stirring constantly for a long time. When polenta was ready, they poured it directly onto the table, eating it right away, all together, not using any dishes! The best thing about this experience is that we eat together at the same table, sharing values and ideas and becoming friends. How did this idea of sharing Italy with visitors come about and what does Km Zero mean? 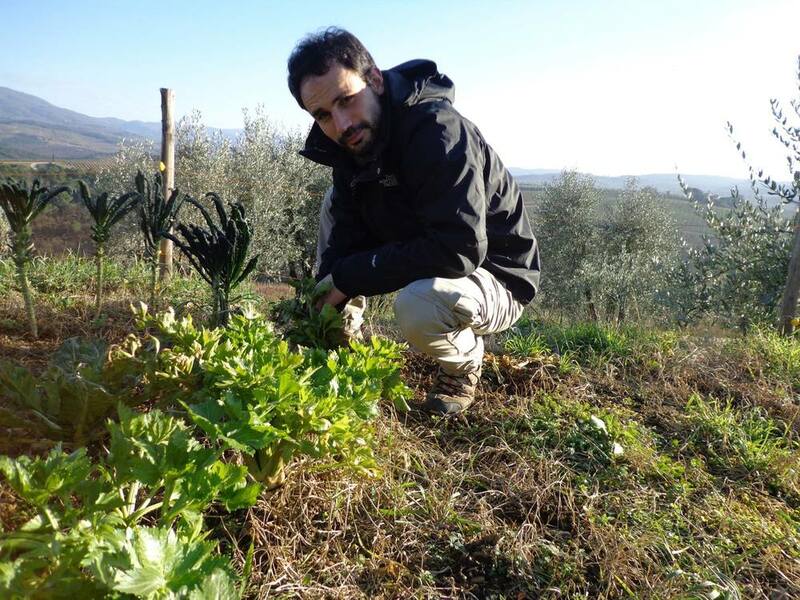 The expression “Km Zero” (literally “no distance”) products, refers to a conscious choice to buy quality products and to consume them as close as possible to their area of production, ensuring freshness, seasonality and biodiversity, as well as strengthening connection with the land. Arianna: Inspired by this concept we developed our project “Km Zero Tours,“ wanting to give people authentic tasting experiences, letting them re-discover ancient traditions and refine their palettes by understanding the journey of a product from farm-to-table. Alla: When your guests return home, what would you like them to bring back to their countries from this experience? Arianna: The best souvenir our guests can bring home is to become fully aware of how a product originates, understanding its history, tradition and the hard work and passion of the producers. We'd love for them to rediscover the pleasure of sharing experiences and values with others, which encourage them to interact with local people, actively engaging with them. Alla: How did you and your partners meet? How did you decide to start this business together? Arianna: Olivia and I are sisters, so we didn't actually "meet," but Alessio (my boyfriend) and I met 9 years ago in Bologna and immediately felt we had in common an endless love for our land and for its products. Precisely this love and genuine passion has led us to get to know a lot of different local producers and to taste their products. It opened our eyes. In most cases we felt that there was no real information about what we eat, and most of all there was no way to witness the passion, experience and knowledge of producers. We created Km Zero experiences to help people to get a taste of Tuscany from a local perspective, through authentic products and meeting genuine and passionate local producers. Alla: Is there a specific moment you can share when you felt especially inspired to be on this journey of sharing Italy with the world? Arianna: We love to tell the story of a time we went shopping at a local market to buy vegetables, cheeses and other products. It was our turn at the stand of fresh vegetables and we asked the lady if she could give us some fava beans (fave toscane). It was late in the afternoon, and she told us that unfortunately the fava beans were already gone. In any other country, perhaps the conversation might have ended at that point, but in Italy, the market is not only a place to buy products, but a place where you can exchange experiences and stories...and you always finish your day with some nice surprises! In Italy, those who are not in a hurry, ready to stop just to have a chat and listen to people...are the ones who gain the most! The lady invited us to wait until the end of her working day, to go with her to her house, where she would give us fava beans directly from her garden. We were not in hurry, so we decided to wait. Not only did we get fresh and delicious fava beans, but we saw her beautiful country house, met her family, and even stayed there for dinner! We returned home with new vegetables and friends, having tasted incredible food while sharing inspiring stories. Alla: What is your greatest challenge for you in your business? Arianna: The most difficult thing being able to transmit a real experience through virtual channels such as the web. Despite this difficulty, we are still managing a method that allows us to overcome this obstacle and to be able to express our philosophy, passion and project. We "Live Like We're Traveling" every single day as we discover and encourage our guests to discover a different and charming world...from the artistry of olive oil making to woodworking. Every experience represents an interesting journey and collection of stories, experiences, parfumes and flavors, that deserve to be savored. The best way to live the "dolce vita" is to follow the rhythms of this beautiful and charming country, enjoying its atmosphere and observing the people. To comprehend their gestures, listen to their stories and take part in the slow and creative lifestyle. Thank you Arianna, Olivia and Alessio! For sharing your work with us today and for sharing Italy with the world in a way that brings us closer to it's people and their way of living. Your advice for living la dolce vita is a great inspiration for us to get to know our own local producers wherever we happen to live. Thank you for reminding us that our taste buds are made happier not only by healthy food but by truly connecting over a meal and taking the time to talk with each other and listen to each others stories. 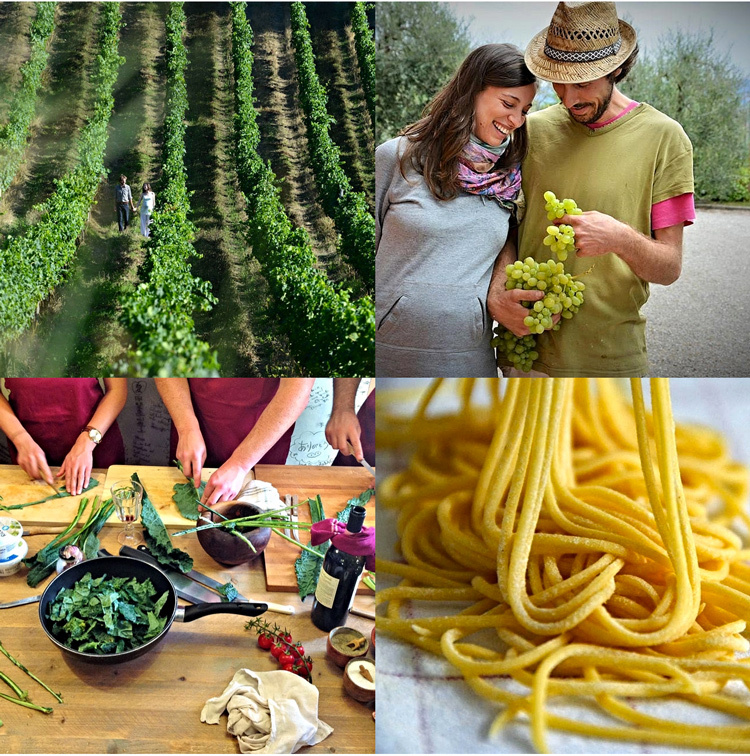 With Km Zero Tours you can really touch Italian culture. Have you ever wondered what it's like to be a wine maker? You can now experience it first hand. What about making goat cheese yourself along side cheese artisan themselves...or prepairing a slow cooked meal from the freshest ingredients while learning Italian? For a complete immersion in the Tuscan way of living, stay in a stone villa, Casa Montrogoli, on the hills overlooking vineyards and rows of Cyprus trees. Perfect for bringing your entire family along!